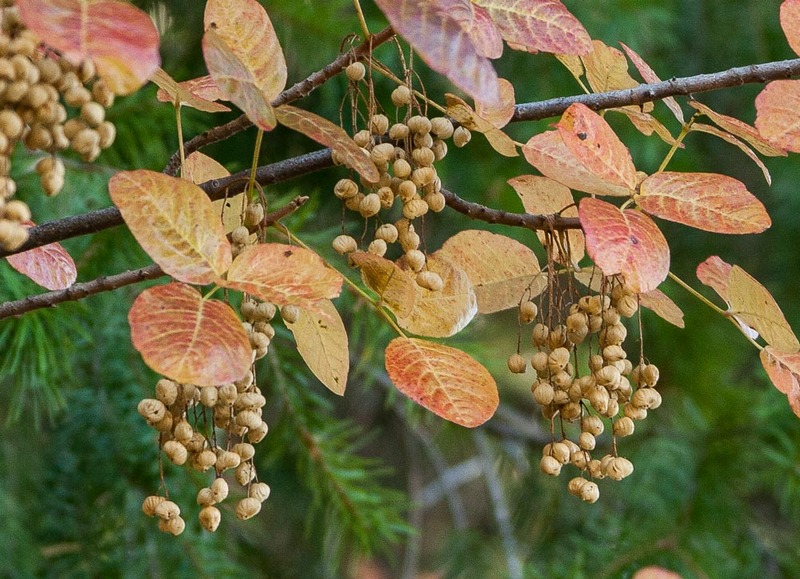 Pacific poison oak, or Toxicodendron diversilobum, is a serious problem plant. 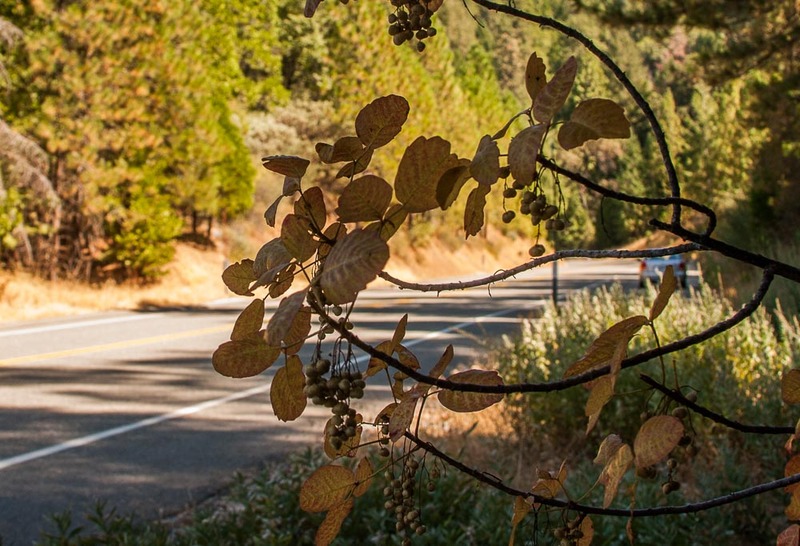 Although it grows almost entirely in California, a lot people live there. 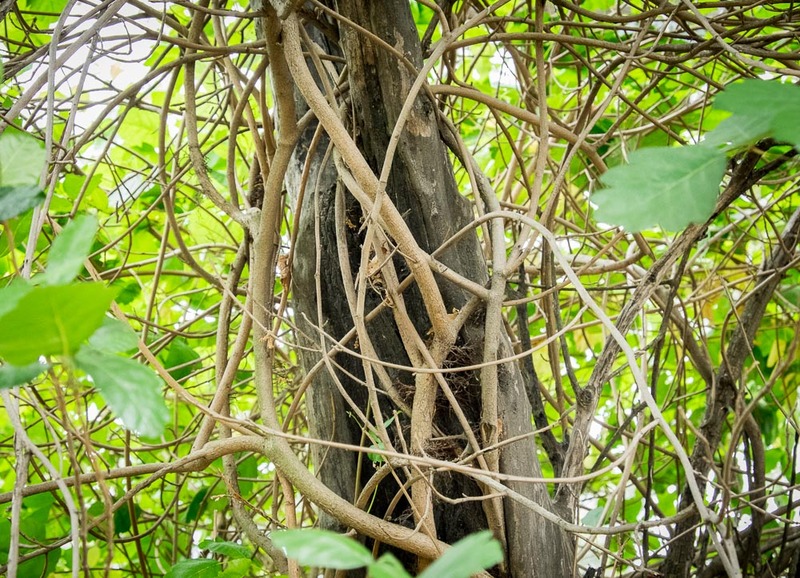 It grows as a ground vine, as a shrub, and as a climbing vine. It can cover huge areas and, when it burns in brush fires, can put people in the hospital. 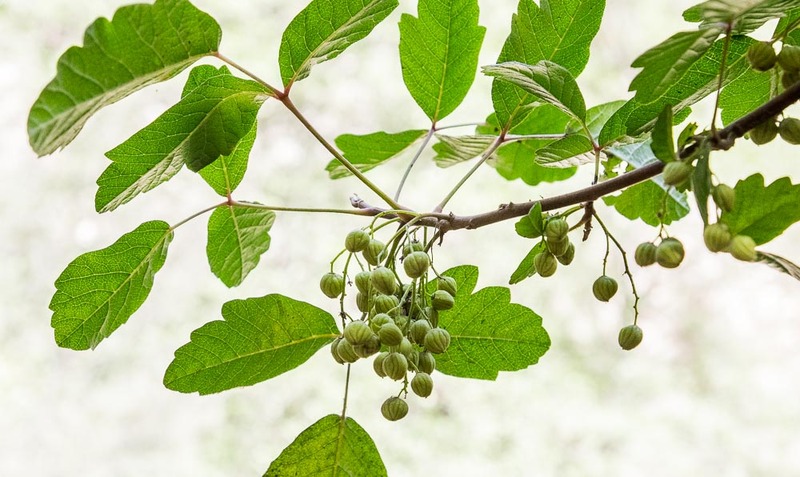 It is not as common as eastern poison ivy is in the East, but there is plenty of it. 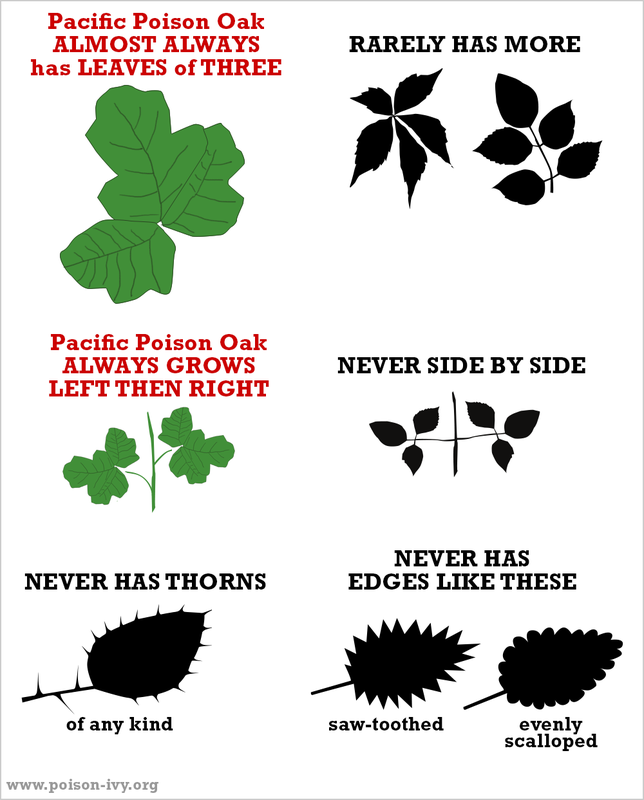 Here is your basic chart of things you CAN count on with Pacific poison oak. If you know that nothing with thorns can be poison ivy, you getting there. Notice that I don't say it never has more than "leaves of three." It ALMOST never does, but in a half-hour walk south of LA, I found 2 plants with extra leaves beyond the three! 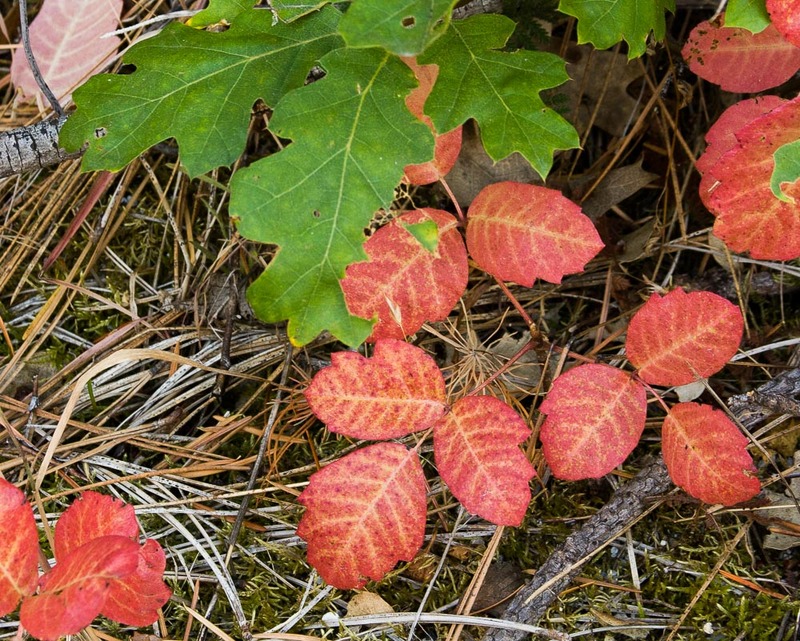 These are typical red poison oak leaves in September. 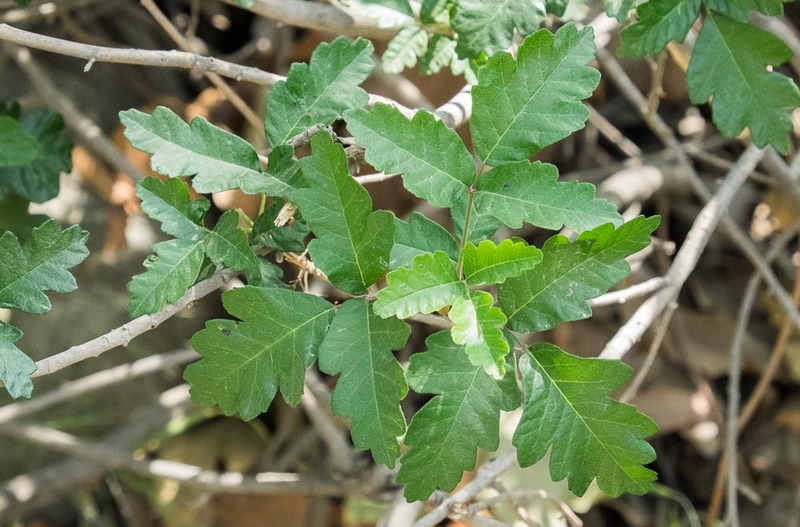 Note that the green leaves at the top are actual oak leaves and don't look much like poison oak. 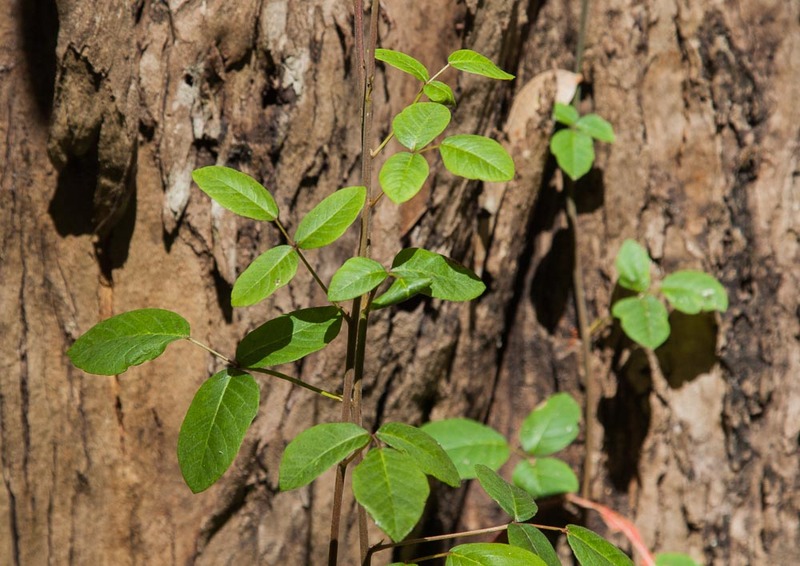 Poison oak leaves with a sharply notched look growing up a thick vertical stalk. This is the shrub form of the plant. 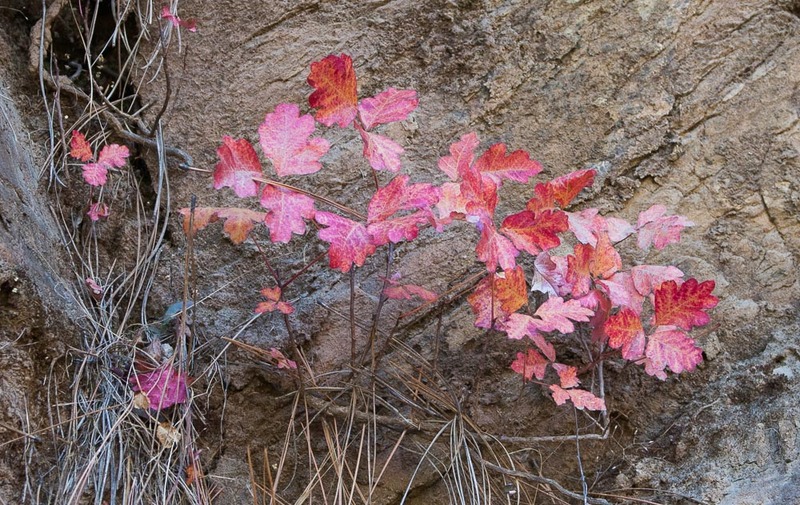 Poison oak ground vine running across the side of a wash. 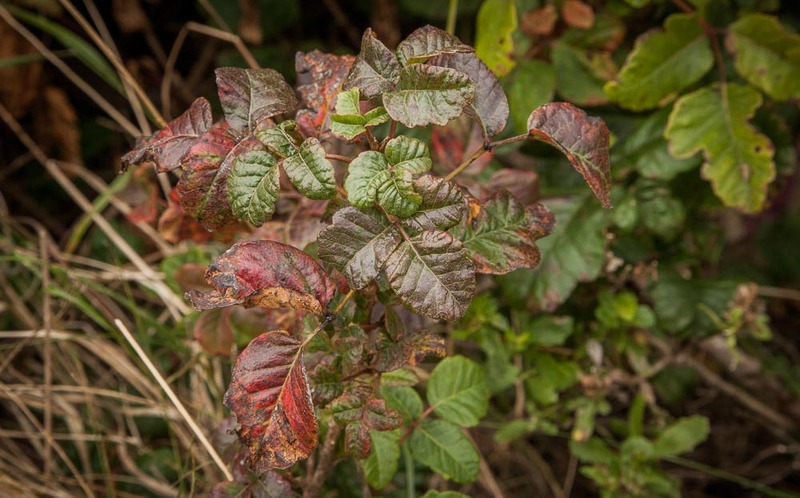 Poison oak probably does useful work keeping soil from washing away. 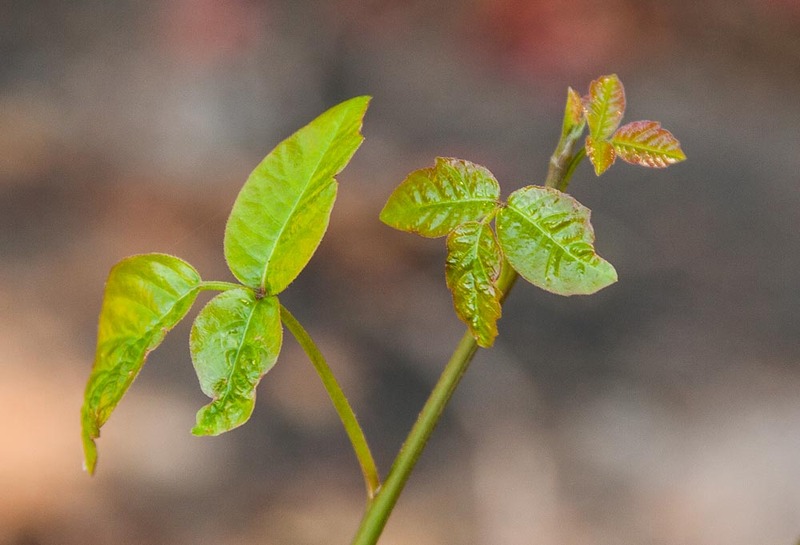 This young sprout of poison oak looks identical to eastern poison ivy, with pointed leaves. Here are poison oak leaves that look much more like actual oaks. But real oaks don't have leaves in groups of three like this. This curly, waxy look is common near salt water (this looks exactly like eastern poison ivy does near the ocean). 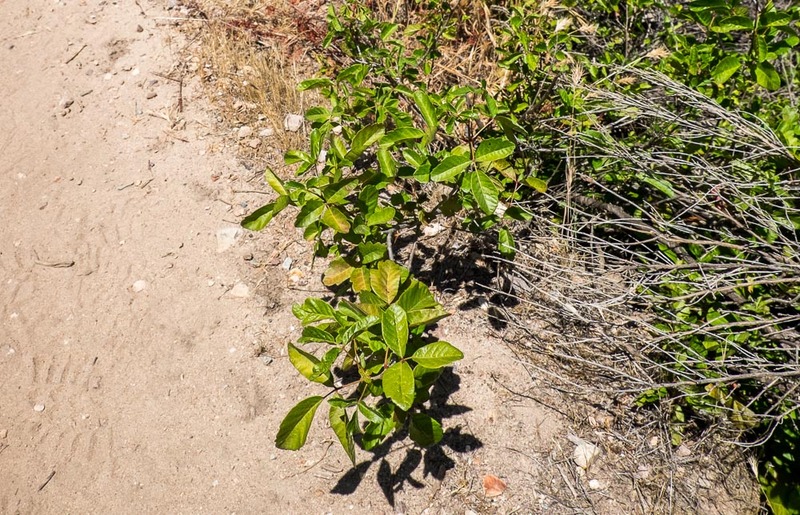 This was a plant growing in strong sunlight at the edge of a trail. The leaves have folded up, possibly to save moisture. 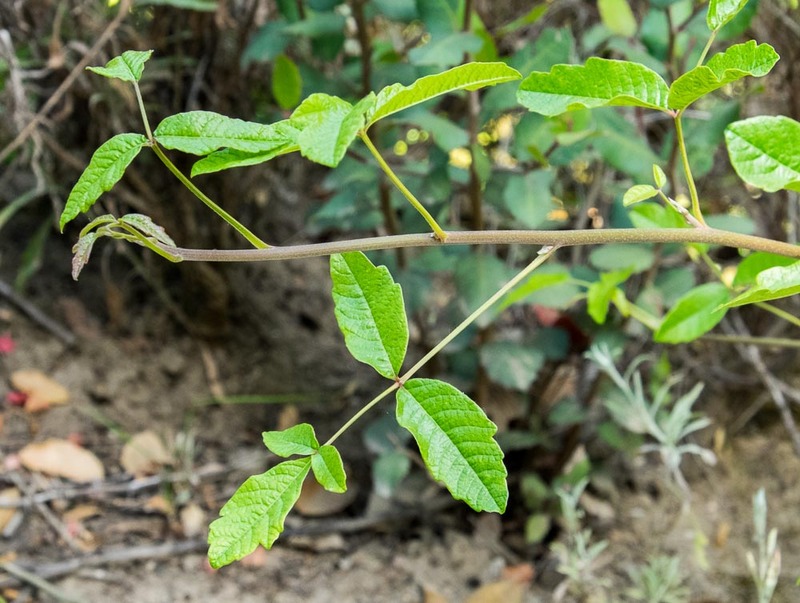 This doesn't look like poison oak (or poison ivy), as its leaves have no notches and are not fatter at the base. But it IS poison oak. This ground vine is reaching out to cross a very dry trail. 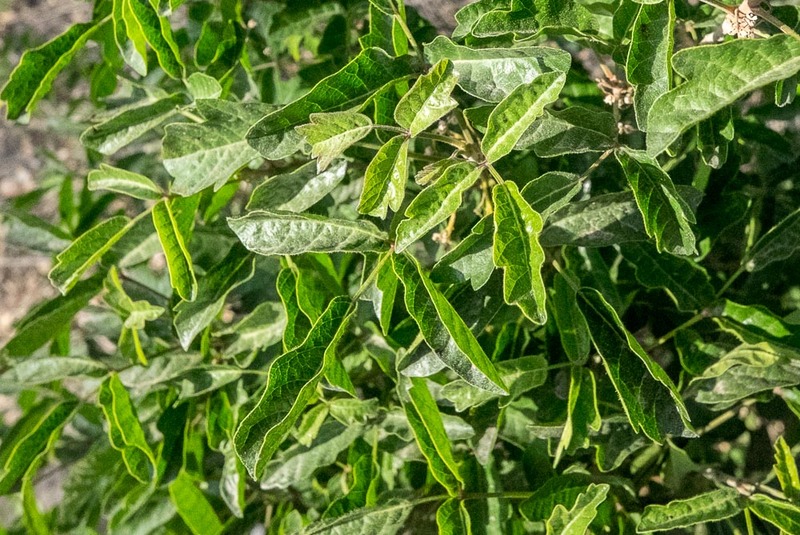 The plant this came out of was a shrub, which shows the plant is extremely versatile in how it grows. Berries hanging from an overhead vine in May near Pasadena. Berries drying in the fall. They are great bird food, but are NOT safe for people. 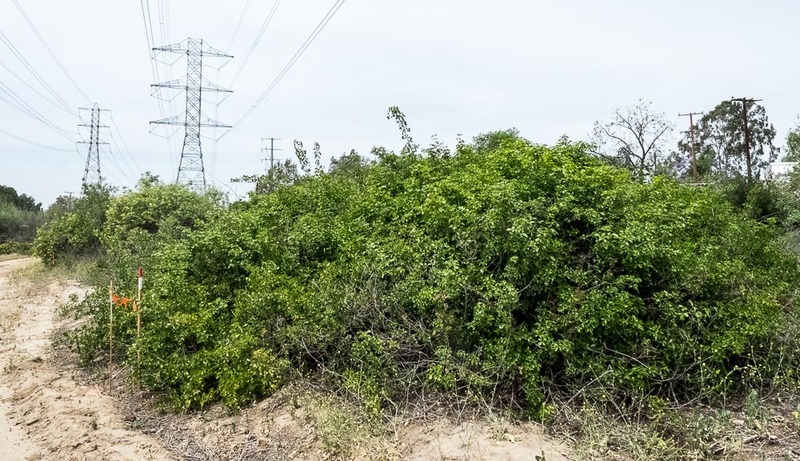 A massive hedge of poison oak growing below the power lines. Crash into this with your dirt bike and get ready for the ER a few days later. 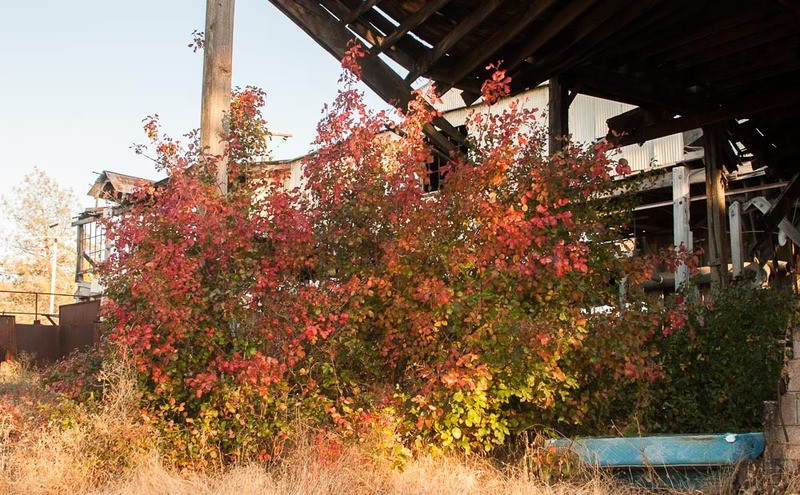 This shows two things: poison oak will take over in abandoned areas, and it can grow into a 12-foot tall shrub. Poison oak by the roadside one the way to Yosemite. 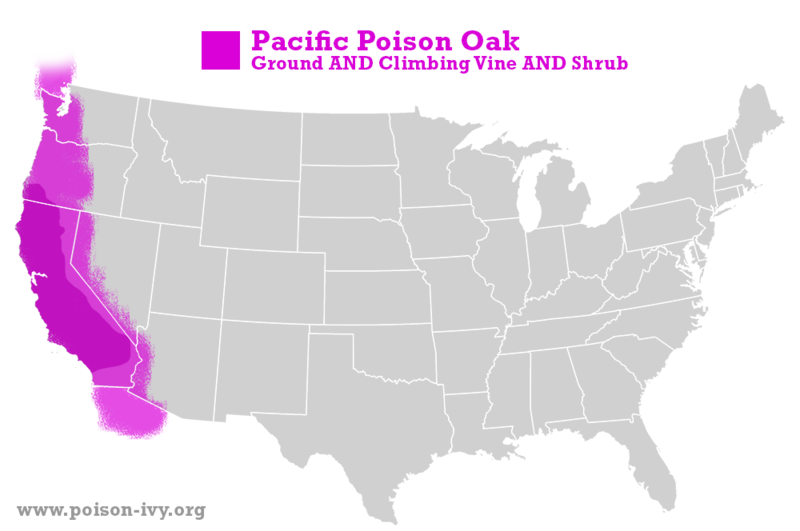 But poison oak does not grow at higher altitude. I found NONE in Yosemite. And I looked! 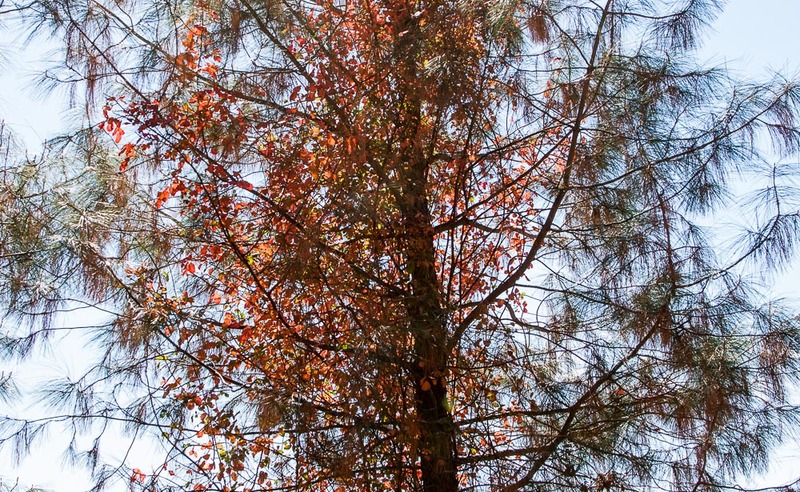 Here poison oak has grown up inside a pine tree. In cases like this, people can mistake the vine for the actual tree and start trimming the branches. 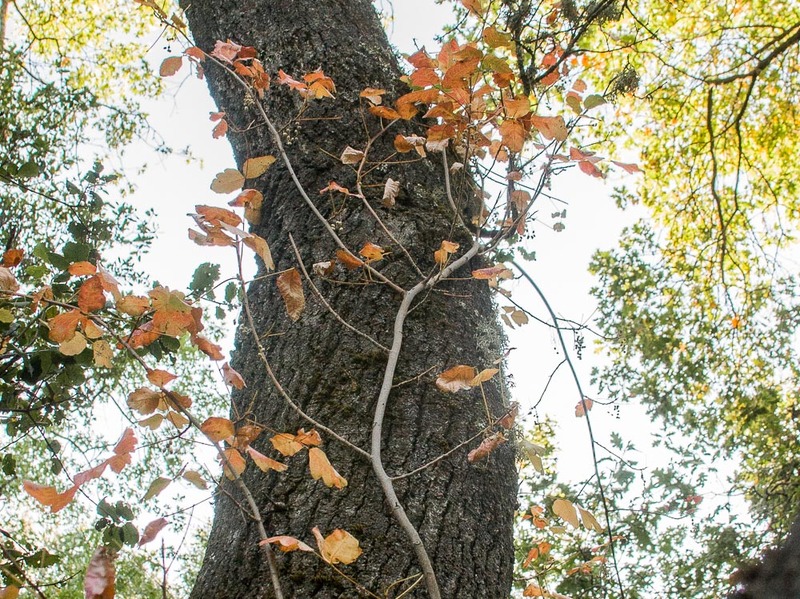 This tree is being swallowed up by poison oak. It has some root hairs, but also wraps around the victim tree. 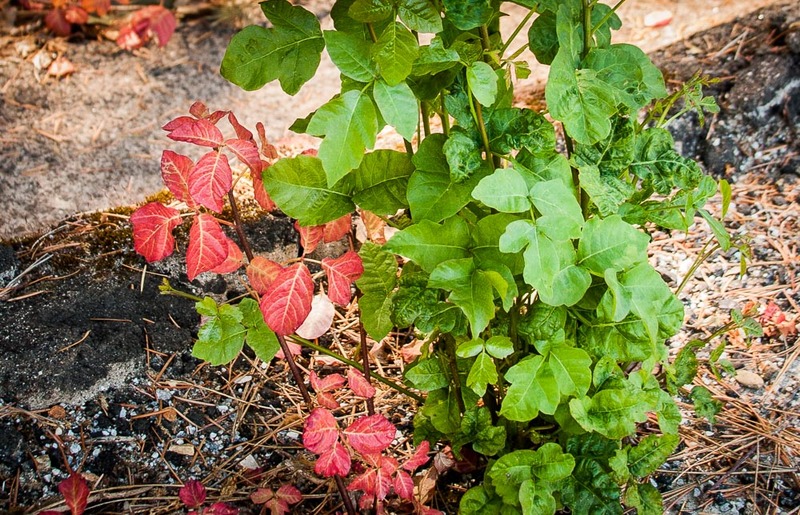 This photo is just here to show that you can have both bright red and bright green leaves on the same plant. For a bonus, look for the wacky leaf that has, instead of the standard three leaves, an extra pair of leaflets! Typical dry California landscape where cows might graze on the dry grass. 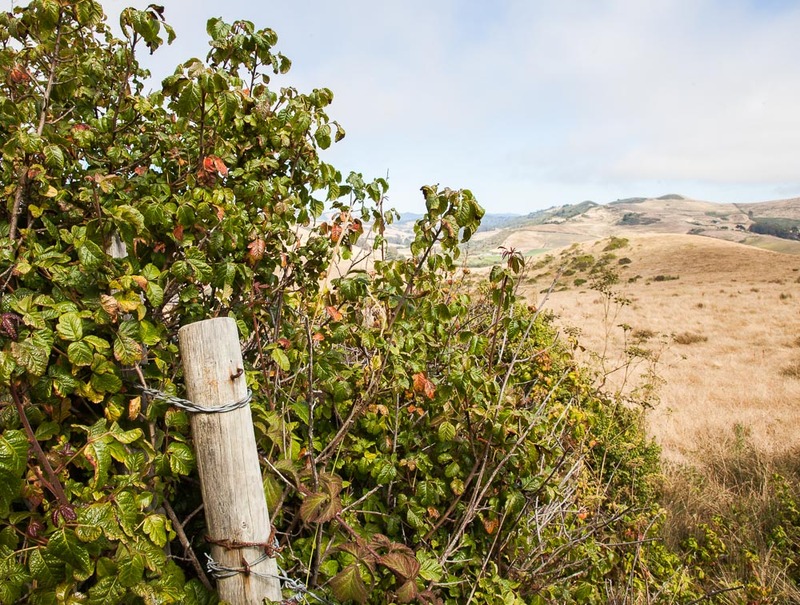 The fence is consumed by poison oak vines that form a shrub. This is a massive hedge of poison oak, about 100 by 300 feet. Note that it doesn't grow up higher on the dryer hill, but stays lower down where there is more moisture. 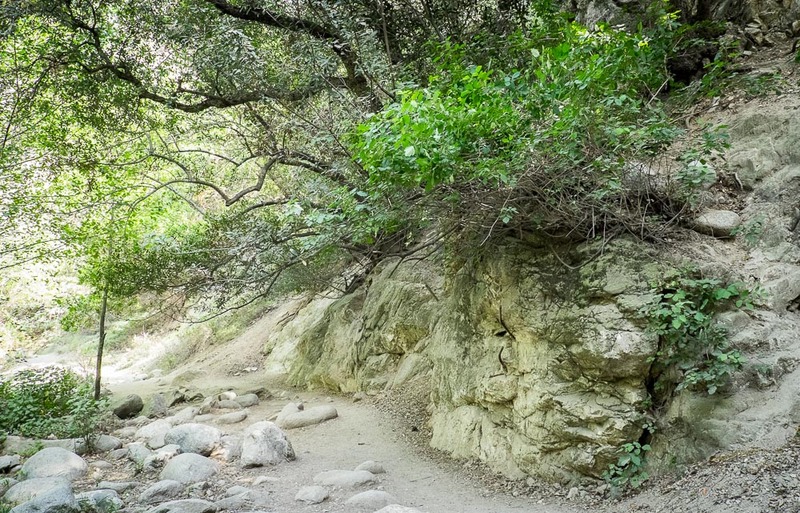 You are walking down this trail and you might grab the overhead branch to steady yourself. 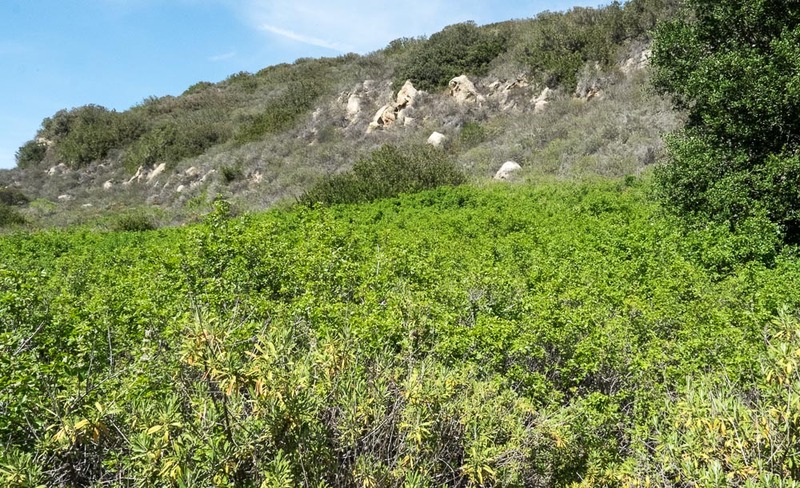 But that green shrub at the top of the little wash is all poison oak. 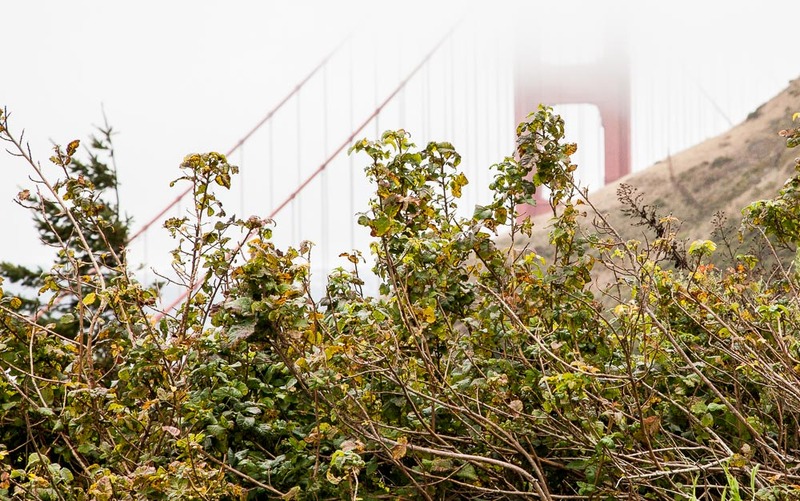 I took this from the lovely headlands overlooking the north side of the Golden Gate Bridge. The area up there is massively infested with poison oak. 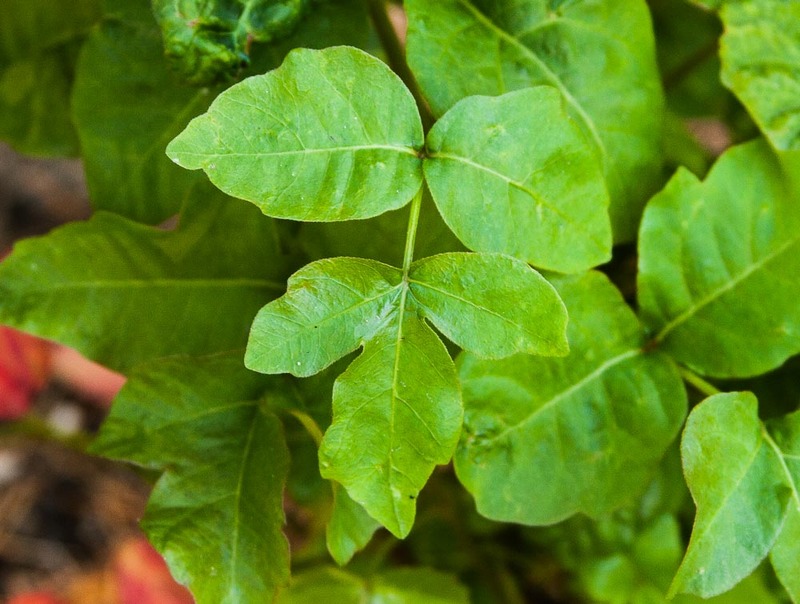 Here we have one of those oddities: a poison oak plant with a strange 3-part end leaf, plus a pair of leaves below. This is not supposed to happen, but occasionally, it does. 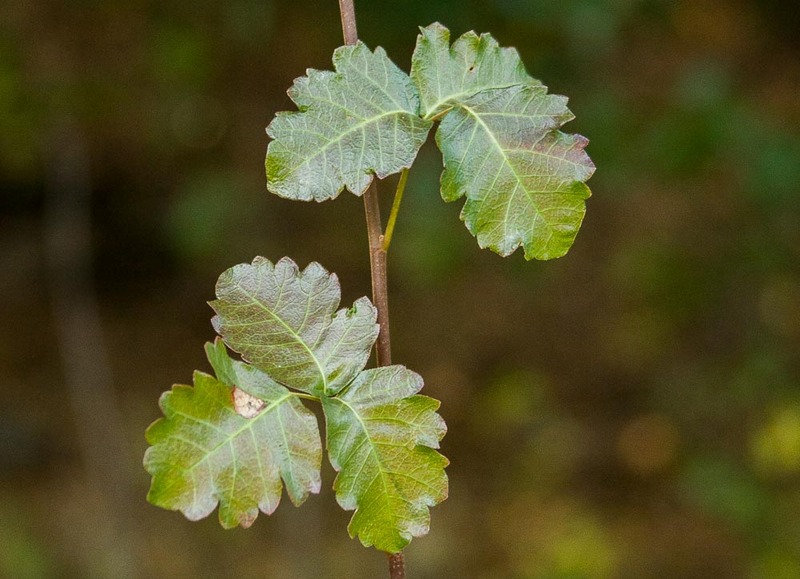 This is what I call The Smoking Gun: proof that on occasion poison oak will form a leaf with five leaflets instead of three. This is somewhat unusual, but not really rare. And I have heard stories about more than 5 leaves, such as 7 or 9.